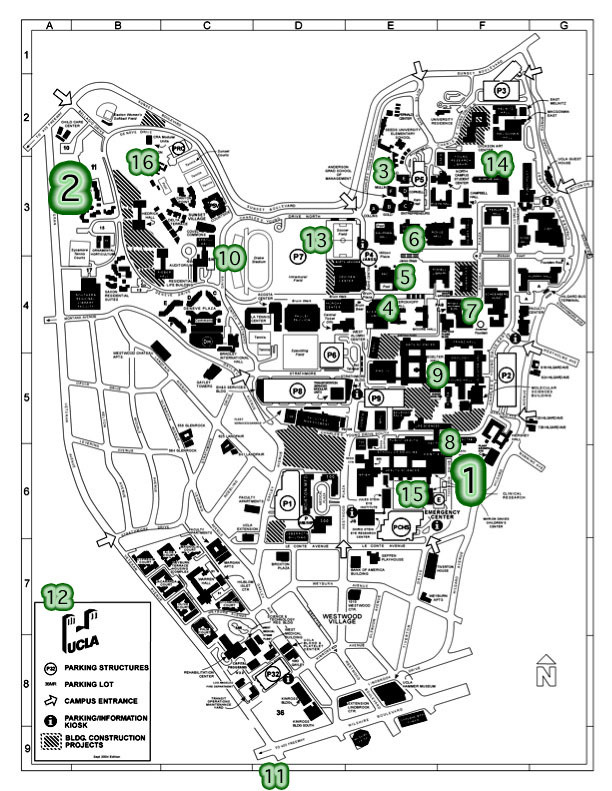 What follows is a map with a few specific places on campus that are good for seeing birds of a specific type or just in general. I know the map is too small to read the building and street labels. Until I figure out a better way to do this, I suggest cross-referencing with the online UCLA map here or the downloadable full-size PDF map here. More locations will be added in the future. I'm especially interested in hearing about more locations from you! Post ideas in the forum. Coming soon: photos of the various locations! UCLA Mildred E Mathias Botanical Garden - The best place on campus to see the most birds. It provides running water (a stream), many types of plants, and concealment, which are all vital to birds. Now don't expect to run into a solid wall of birds on just a five minute walk-through. But if you spend about an hour there you'll probably see, or at least hear, several different types of birds. The Native Fragment - This little known corner of UCLA, back behind the Dorm Suites & Sunset Canyon Rec Center, is the largest chunk of native plant life on campus, hence the moniker. It's really the last wildest place in the vicinity and therefore home to many birds, some of which you won't see anywhere else around campus. It is approximately 4 acres of coastal sage and oaks. 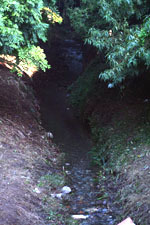 Stone Canyon Creek - This is a small stream behind the Anderson School. The running water attracts several types of birds; plus, it's a very nice little grove to relax in. Read more at the Stone Canyon Creek Bird Survey site! There is a bottlebrush plant next to the stairs that lead down from the Ackerman to Bruin Walk (at the top of the stairs is the entrance to Wetzel's Pretzels, Rx Candy, etc). When it is blooming, it's a great spot to watch for hummingbirds, bushtits, kinglets, and others, because you can get really close to the flowers. Campus Corner Eatery. When it was opened, it used to be a great place to see House Sparrows, Brewer's Blackbirds, Pigeons, and sometimes European Starlings, mostly because of all the people eating right there. When they eventaully reopen some kind of eatery, this will be a good spot again. There is a Silk Floss Tree (spiky trunks, hanging pods) at the top of the stairs that lead down to the Fowler Museum from Royce Hall. The Yellow-Chevroned Parakeets can be seen feeding here from time to time. A flock of pigeons lives on the side of Knudsen Hall. They feed near the trees below every day. You can easily observe their flock behavior and color variations. Every once in a while, other birds may land high up on Knudsen, including Red-tailed Hawks, House Finches, and probably Swallows of some sort. There are two Raven's nests high up on corners of the Factor building. You will almost certainly see a few ravens around here in the Spring. The bombshelter is a great place to see a variety of smaller birds. The combination of bottlebrush trees and people eating food leads to regular sightings of: hummingbirds, House Sparrows, House Finches, Lesser Goldfinches, Ruby-Crowned Kinglets (winter only), and Bushtits. I noticed a lot of bottlebrush plants along Charles Young Drive in front of the dorms here. You can probably see a lot of hummingbirds here. There are also Silk Floss Trees at the Veteran Park next to the Federal Building. Parakeets! The Veteran's Affairs Center on the norht side of Wilshire just west of the 405 freeway, and the National Cemetery right next to it (on the east side of the 405) are outstanding places close to campus to see birds. There isn't a lot of human activity around most of the many structures at the VA Center, and there are many trees and other plants for birds. Same with the cemetery. Between these two places you can see many birds you won't see as easily or at all elsewhere: cliff swallows, western bluebirds, cassin's kingbirds, american kesterls, and more! Anyone is allowed to enter, but be warned that you're not supposed to "film" (including photograph) without permission. Building 209, towards the back of the whole place, is where you can find a colony of Cliff Swallow nests. Intramural & Soccer Fields. Killdeer can be seen roaming around on these large grassy fields, especially early in the day and when there aren't a bunch of people using the fields. Robins may be attracted here too. Western Meadowlarks and Savannah Sparrows have been seen here, and hawks also probably fly overhead from time to time. The Murphy Sculpture Garden. I haven't spent much time there recently to document this, but the grassy lawns could make this a good spot for seeing Killdeer, American Robins, Western Meadowlarks, Brewer's Blackbirds, Brown-headed Cowbirds, and other guys who like to eat worms out of the grass. I know that gangs of Crows and flocks of Ruby-crowned Kinglets can be seen there, in the trees and bushes. I've also heard that Scrub-Jays are seen there. Center for Health Sciences (CHS) Plaza. This is a nice little bit of green grass with a few trees and bushes around its edges. Ravens, House Sparrows, and House Finches can be seen here, but less common birds also are prone to show up (e.g. Cedar Waxwings, and probably birds that like grass), probably due to the plaza's proximity to the Botanical Garden. Sunset Canyon Recreation Center. If you go to the upper reaches of this area you've got a good cahnce of seeing a variety of birds: Scrub-Jay, Mockingbird, Ruby-Crowned Kinglet, or even Spotted Towhees or a Dark-eyed Junco! Probably others too. Look in the trees and bushes that provide cover for birdsand keep an ear out. The Rec Center's proximity to the Native Fragment probably helps a lot.